Long have I prowled the streets of Nairobi looking for these series, and finally I found it. (Ha. There’s a pun in there) I kept finding number sijui 11 sijui 13 (which means I have quite a ways to go, sigh). I now realize I should have bought them while they were 50 bob, because nowadays, vendors tell me 200 as I resist the urge to not laugh in their faces. ANYhue, (post officially begins here>>) A Series of Unfortunate Events is a series by Lemony Snicket. I found the first book (or rather, Book the First, as he prefers), which is called ‘The Bad Beginning‘. Of COURSE the first thing I wondered was whether that is his real name, and so, God Bless Wikipedia, I Wikid him. You should too. It’s an interesting read. Both the Wiki page and the book. 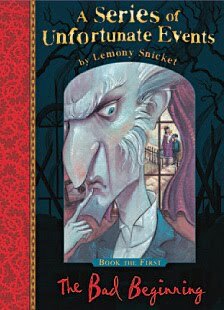 At the end of the book, it declares that ‘Lemony Snicket was born in a small town where the inhabitants were suspicious and prone to riot. He now lives in the city. During his spare time, he gathers evidence and is considered something of an expert by leading authorities.’ Just the kind of author’s description I like. The illustrator is Brett Helquist, who was ‘born in Ganado, Arizona, grew up in Orem, Utah, and now lives in New York City. He earned a bachelor’s degree in Fine Arts from Brigham Young University and has been illustrating ever since. His art has appeared in many publications, including Cricket magazine and The New York Times.‘ It figures I would like the drawings, for I used to LOVE Cricket when I was a kid (ok, ok, I STILL love it. Sheesh) and often (still do, yes, yes, potato, potato) wished to write for it. I apologize, dear reader, I underestimated my long-windedness where books are concerned. This may go on for a bit. I can’t make any promises. On the cover there is a sticker that says this was recommended in Jacqueline Wilson’s Great Books to Read Club or something. Which follows, because I love me some Jacqueline Wilson. As should be apparent to you by now, I am severely attached to my childhood, seemingly incapable of venturing out to other authors I didn’t read during it and part of my psyche still exists as an extension of said childhood. This, of course, explains a lot. Anyway, on the inside cover, it says ‘Ex Libris’, which I think is awfully romantic (not in the sense you think that word means), because in Latin, that means ‘from the books of’ or ‘from the library of’. I can’t wait to write my name in. I feel I need a calligrapher’s pen, or summat. The writing sounds very Brit, which is surprising to me as he is American. It took me less than hour to finish, because the print is rather large, but it is such a good read. I was reading it in the middle of the book I was SUPPOSED to be reviewing for this post (Marlfox by Brian Jacques) and I couldn’t put it down. I desperately wanted to watch the movie when it came out, because Jim Carrey was in it, and I am on a parallel universe having his babies, and he was the original Johnny Depp. I really, REALLY (reheheheheheheeaaallly) like Jim Carrey. Still haven’t watched the movie, though. It gets 4 stars. You can get it from me for 20 bob for a week, after which I will start charging you an unnecessary amount of interest. I leave you with an excerpt from the book; page 1. If you are interested in stories with happy endings, you would be better off reading some other book. In this book, not only is there no happy ending, there is no happy beginning and very few happy things in the middle. p.s. Whop whoop! My first review!! p.p.s. Also, did you see me in the paper? The blog, I mean. Zuqka for Friday. Saw you in the paper, girl! Or rather, saw the blog. Why so modest and retirng? Hats off and another feather on your hair! Cheers! I am assuming it's a 4 out of 5? Also (and I know this is a tough question), what is your hands down favorite book? Too, too hard! WOw. Just one? Maybe top 50. Lol. I can't pick just one. It is probably a Roald Dahl, though, or a fantasy writer like David Eddings. Thanks. :o) My all time favorite?